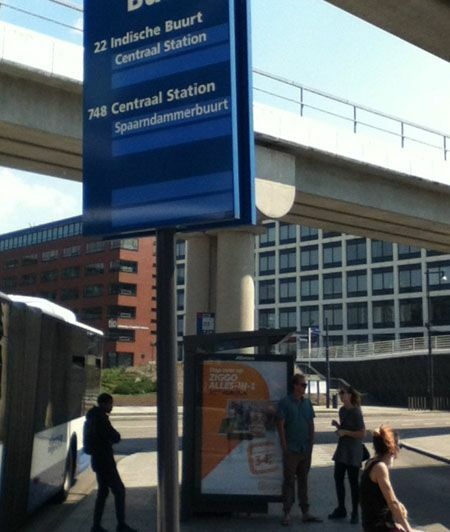 Waiting for the bus to beautiful downtown Amsterdam at the Holiday Inn Sloterdijk Station. As previously noted, the managing editor assigned me the task of reporting on the recent offshore conference, “Northern Europe (and Russia) in the spring of 2016” — from which everyone on the counterweights staff returned safe and sound, late last week. It is a task I have accepted in the past. But this year I rebelled. Immediately upon arrival in Amsterdam on the morning of May 12, Ms X and I bolted to a cruise ship party, at the Holiday Inn Sloterdijk Station. 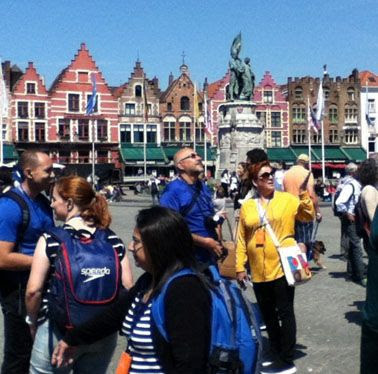 Marvelling at the medieval marvels in Bruges/Brugge. In a another lexicon Bruges is “a fairy-tale medieval town … cobbled lanes and dreamy canals … market squares lined with soaring towers.” It struck me as a worthwhile tourist trap. Our trip to Bruges from Amsterdam also introduced us to the first of three engaging female tour guides, with strong interests in history. Our bus ride was enlivened by our guide’s account of the remarkable creation of “polders” (ie “any piece of land reclaimed from water”) — in a region where as much as 25% of the current territory is below sea level. Killer bikes of Amsterdam at rest. 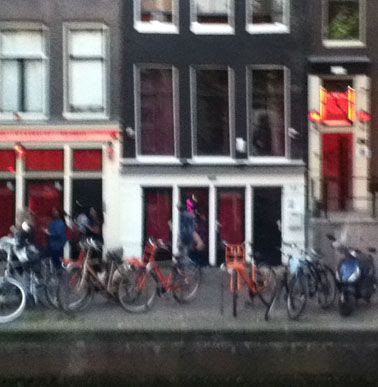 Our guide also wisely warned against the “killer bikes” in Amsterdam. And she explained how Netherlands citizens look down on “stupid Belgians” (of both French- and Dutch-speaking persuasions), whose only contributions to global humanity are chocolates, waffles, smurfs, and the EU capital city. Our ship would stop first at “Warnemunde (for Berlin),” Germany. Then it would be “Tallinn, Estonia,” followed by “St. Petersburg, Russia” (the alleged jewel in the crown, for two days). And then : Helsinki, Finland ; Stockholm, Sweden ; and Copenhagen, Denmark. 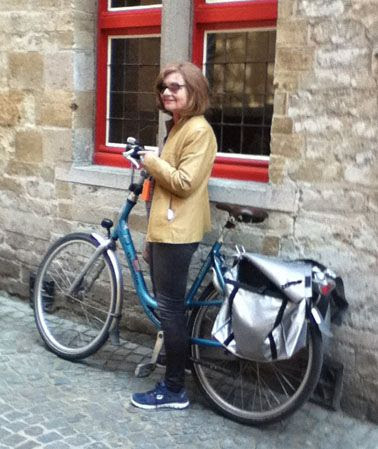 We were in Bruges, in Belgium, and suddenly the managing editor appeared. It was another three-hour bus ride from “Warnemunde (for Berlin)” to the current united Berlin in the united Germany under Angela Merkel (originally from the East!). Lorna answers some of the group’s questions. It was worth it because of the tour guide — the altogether excellent Lorna Cannon, already famous enough on the BBC website and in such publications as The Maybachufer : English Language News from Berlin. This meant one big countryside traffic jam on the bus trip there, and presumably a somewhat different crowd in the city than on a more ordinary Monday afternoon. But in most places we went there were already so many other tourists that it didn’t really matter. In what follows I have written far more about Berlin than I should have. 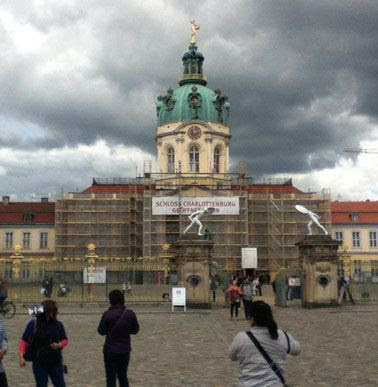 In any case, Lorna’s Whit Monday tour started at the Schloss Charlottenburg — “a Baroque palace … in Berlin’s western Charlottenburg district … burned to the ground during the Second World War but … completely reconstructed” today (though also right now “closed for renovation until 2017”). From here you proceed in your tour bus along Otto-Suhr-Allee to Ernst Reuter Platz and Strasse des 17. Juni. Then you drive along Strasse des 17. Juni to and through the giant public park known as the Tiergarten (larger than Central Park in New York), and past the 1873 Siegessäule Victory Column moved by the Nazis to the Grosser Stern roundabout in 1938. 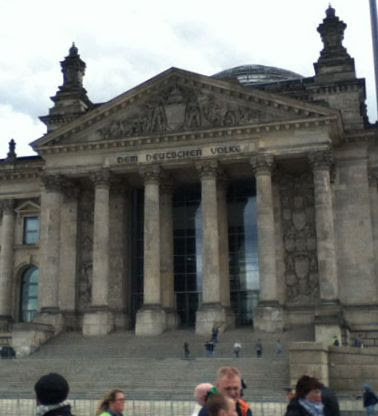 The Reichstag building, current home of the Bundestag or parliament of the reunified Federal Republic of Germany. Just as the Tiergarten ends, drive a little north and stop to get out and admire the Reichstag building, home of the German parliament. It first opened in 1894. The “iconic words Dem Deutschen Volke (‘[To] the German people’)” were “carved above the main façade of the building” in 1916. Today, as renovated in the 1990s under the leadership of British architect Norman Foster, the Reichstag building houses the institution now officially known as the Bundestag — the parliament of the (reunified) Federal Republic of Germany. Just a little south of the Brandenburg Gate is the Berlin Holocaust Memorial (“officially named the Monument to the Murdered Jews in Europe”), opened in 2005. 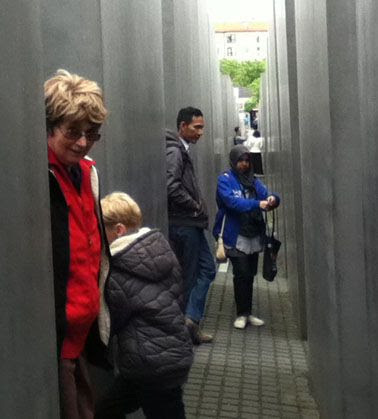 Designed by the US architect Peter Eisenman, it is “made up of 2,711 concrete slabs that bear no markings, such as names or dates.” According to Lorna Cannon, Eisenman’s design invites each visitor to come to his or her own understanding of what the holocaust means. 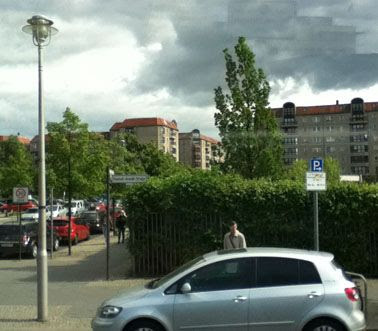 A little south and west of this spot on Hannah Arendt Strasse in Berlin is the site of the bunker where Adolf Hitler killed himself, on April 30, 1945. At this point in our tour we stopped for a brief late lunch — at a surprisingly good restaurant (and adjacent public washroom) near the intersection of Hannah Arendt Strasse and Cora Berliner Strasse, close to the Holocaust Memorial. I bought a map at a souvenir shop near the restaurant, and Lorna showed me where we were on the map. 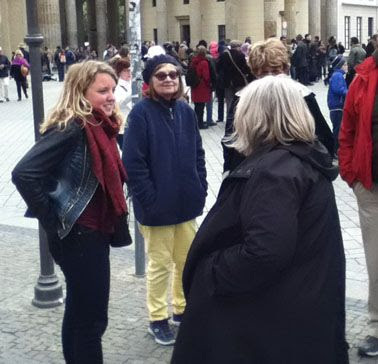 Just as we were leaving on our bus, to return to Unter den Linden, Lorna pointed out the site of the bunker where Adolf Hitler and Eva Braun committed suicide on April 30, 1945, a little south again of Hannah Arendt Strasse. Then our genial and unilingual German driver (Otto?) 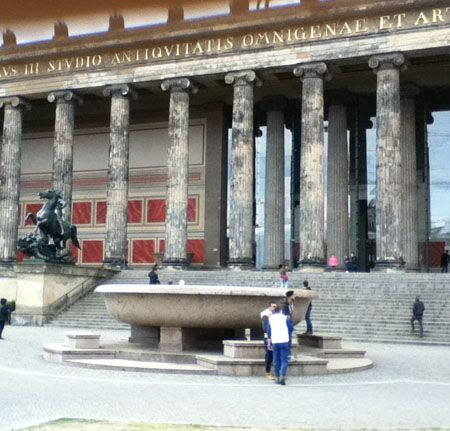 went east on Unter den Linden, past such sites as Humboldt University. 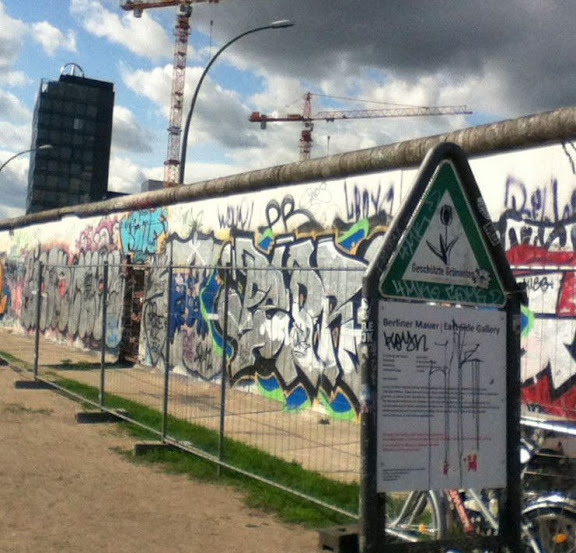 More recently, the East Side Gallery has also attracted some (in Lorna’s words) “disrespectful” graffitti — presumably the reason for the present-day fencing we saw as well. Bullet-pock-marked columns of the Old Museum (or Altes Museum in German) in the Lustgarten. From here we just retraced our steps (or bus tire marks) back to Unter den Linden, where we stopped for a visit to assorted museums and the Berliner Dom (“largest protestant church in Berlin”) in the Lustgarten. The Konzerthaus Berlin in harmonious Gendarmenmarkt. 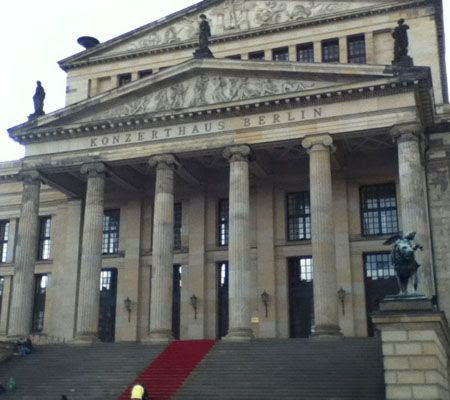 I was especially impressed by the “three buildings which make up the spectacular ‘trinity ensemble’ in the Gendarmenmarkt square” : (1) the Konzerthaus or Concert Hall, built in 1821 by “Berlin’s famous architect, Karl-Friedrich Schinkel” ; (2) the Französische Dom (or French Cathedral), built between 1701 and 1705 (and then added to in 1785) by persecuted Huguenots or French Protestants, seeking “refuge in Protestant Berlin” ; and (3) the Deutscher Dom (or German Cathedral), a 1708/1785 “twin” to the Französische Dom across the square. 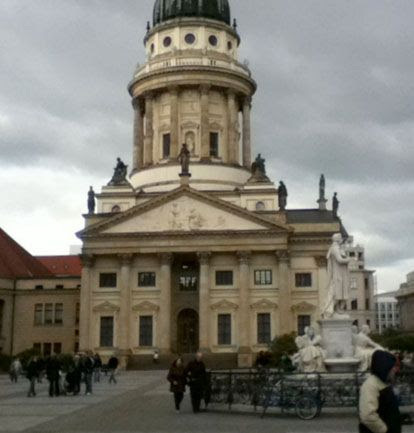 The French Cathedral in Gendarmenmarkt — twin of the Deutscher Dom. The statue to the right in this photo is of the German poet, philosopher, physician, historian, and playwright, Friedrich Schiller (1759–1805). All three buildings were seriously damaged and worse during the Second World War, and have been subsequently restored and rebuilt. Ms X and I briefly visited the Deutscher Dom, which now houses five floors of intriguing exhibits on the history of German parliamentary democracy, from “the revolution of 1848/49” to the more or less present day. 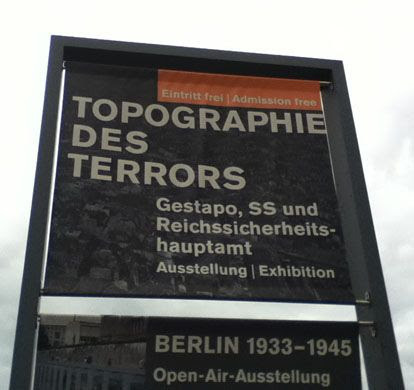 Then Lorna finally left us in the good hands of a quite recent building with elegant large public washrooms — housing an exhibit on the “Topographie des Terrors … Berlin 1933–1945.” She said her goodbyes on the bus before we left, and proposed a round of applause for the bus driver. The driver received another round of applause when he managed to get us back to our cruise ship at the port of Warnemunde in less than three hours. Soon after we arrived, the big boat (a marvel of modern engineering in its own right) set out on the next leg of our journey, just before midnight. At that point we were all in the Ocean View Café on deck 14 for a late-night snack. 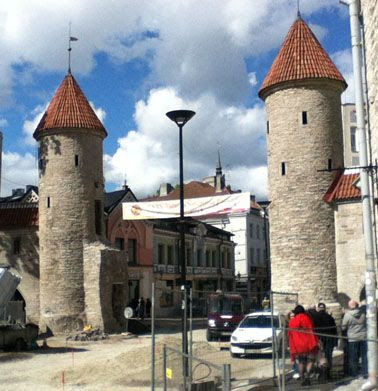 Viru Gate to the old city at Tallinn (formerly Reval), just one more thing in northern Europe today under renovation. CITIZEN X REGRETS : UH OH … This is taking up far more time than I planned on — time I don’t seem to have right now … At some point I hope to come back and complete these notes, for which I have collected far too much source material. 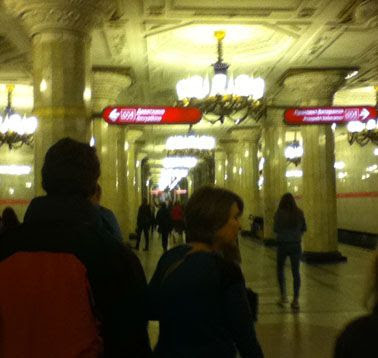 In the St. Petersburg subway ... an unusually artistic place. Meanwhile, my apologies to all involved … It seemed best to post at least what I did manage to get done … And leave these global villager travels behind us for now. Summer in the city is drawing near … It is time for the counterweights staff to get back in action, and stop saying everything must wait until I finish this report … (which could be a very, very long time).